Elon Musk has said the Tesla Model 3 will have a solar roof, and Panasonic, Tesla’s biggest partner in developing the new solar panels and batteries, debuted exactly what that might look like on Tuesday. Released at a press event in Osaka, Japan for for the Toyota Prius plug-in hybrid, the Panasonic-made roof isn’t confirmed to be an option for the Tesla Model 3, nor is it available in America. Panasonic is calling the solar roof the “HIT™ Photovoltaic Module for Automobile.” Although it has currently only been adopted for the Prius, Panasonic suggests suggests that the company is working to “expand the use” of the roof on other electric vehicles as well. In the past, solar roofs have had limited use because the solar cells were only able to charge 12 watt batteries. 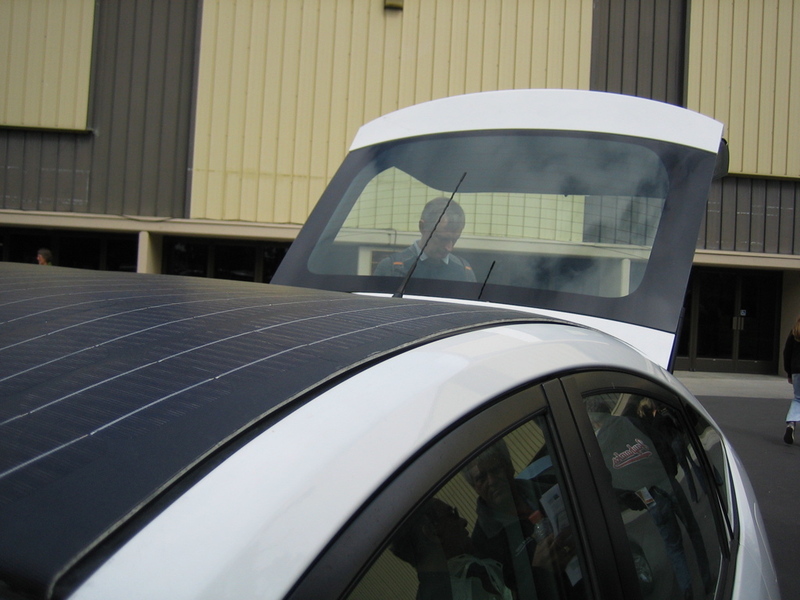 Installing a solar roof on a third generation Prius allowed the car to use the solar power to run the fans in the air conditioning — and that was it. But the 180W option turns a solar roof from a novelty item into something actually useful. The solar roof as seen on the Prius Prime. With 180 watts of charge, the solar roof can actually charge the car battery itself. And since Panasonic says that this should increase the travel distance of electric vehicles, a solar roof could get you those last few miles to a charging station — or just to a sunny parking lot. The solar roof on the Prius PHV is only available in Japan and Europe right now because it doesn’t yet meet U.S. safety regulations for the way the glass on the roof shatters. This isn’t really a problem for Tesla, which is already in the business of making its own glass. And the glass isn’t just for the windshield — after a test drive event for the Model 3 last year, the company revealed that there would be an option to chose to have either a panoramic or fixed glass roof on new Model 3s. So figuring out a way to get the glass in a solar roof to pass crash tests in the US is unlikely to stall Tesla. Until then, the solar roof on the Prius is our first look at what the technology for a Model 3 solar roof is probably going to look like, and that’s pretty slick.